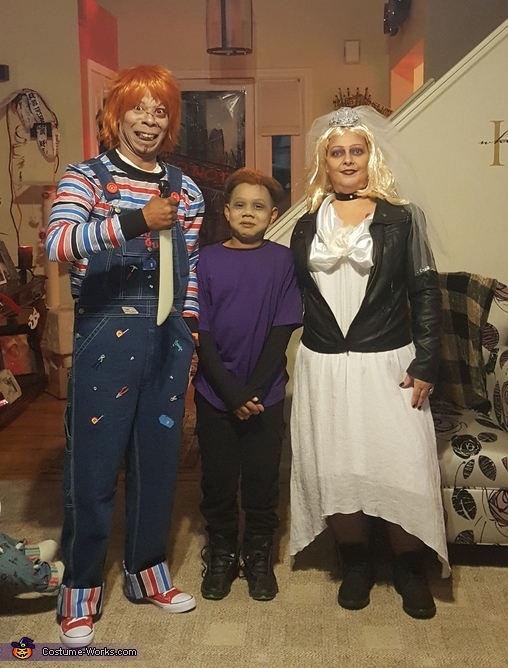 The costumes are my husband (Rickey) and I(Michelle) and our grandson (Max). I've been wanting to make these costumes for the past couple years. So I finally did it! FOR CHUCKY: I just bought some overalls and glued some little craft sticker tools to them, then cut out the good guys letters and stuck them on the front of the overalls, I also sewed red buttons on the overalls. I bought red airwalks for the shoes. I bought the material and made the shirt (all sewn by hand) and put the cuffs on the bottom of the overalls to match the shirt. Bought a short orange wig to go with the costume. I made his face up with foundation and halloween makeup....I drew bloody scars on his face too.That probably cost me about $65.00 to make. THA BRIDE OF CHUCKY: I already had an old white dress and I bought a small piece of white satin to put on the top of the dress to make it look more wedding like. I wore black timberland boots that I already had and a pleather jacket that someone have me. I already had the tulle to make the veil. I bout a medium length blonde wig and used a Sharpe to put dark roots on it. I spent probably about $15.00 making this costume. Our costumes were a big hit at our Halloween party!!! !